To solve basic math operations — and more complicated ones down the road — kids need problem-solving skills and number sense. Number sense is the ability to understand what numbers mean, how they relate to one another and how they can be used in real-world situations. Seven-year-olds are working on adding and subtracting with more sophisticated strategies, like "counting on" from the higher number for addition, or base-10 facts to compose or decompose numbers. Two-digit addition and subtraction is being explored too. This easy game can help your child memorize her subtraction math facts by figuring out "What's Hiding?" This easy game can help your child memorize her subtraction math facts by figuring out "What's Hiding?" Start with 20 pennies (or other counters, like beans or buttons). Have your child cover her eyes and take a certain number away, hiding them out of sight. When your child figures out how many were taken away, write it down as a math fact (e.g., 20 - 7 = 13). Take turns hiding objects to practice more math facts. While cutting up food to share, ask your child to help. While cutting up food to share, ask your child to help. For example, when cutting a pizza, ask how it should be divided into halves — two pieces. Then ask how it should be divided into fourths — four pieces. Have her figure out how to cut it into eight equal slices, and then point how four out of eight slices is the same as half of the pizza. Playing with dominos is a great way to have your child practice subitizing and adding at the same time! Playing with dominos is a great way to have your child practice subitizing and adding at the same time! Subitizing is the ability to look at a group of objects and instantly know how many there are. Have your child pick a domino and then ask for the sum of the two sides — in other words, ask her to add the two sides together. If one side has three dots and one side has five, she would say, 3 + 5 = 8." Then flip the domino around, creating the number sentence 5 + 3, instead. It still equals 8! Before long, your child will discover the commutative property of addition — that no matter what order the two numbers are in, they still add up to the same total. Help your child practice adding multiple numbers with a DIY bowling game. Help your child practice adding multiple numbers with a DIY bowling game. Use 10 empty soda cans, toilet paper rolls, or water bottles to create bowling pins. Label them 1 through 10. Using a small ball, have your child try to knock down the pins from a distance. To keep score, have your child add up the numbers knocked down. The person with the higher score wins the game! 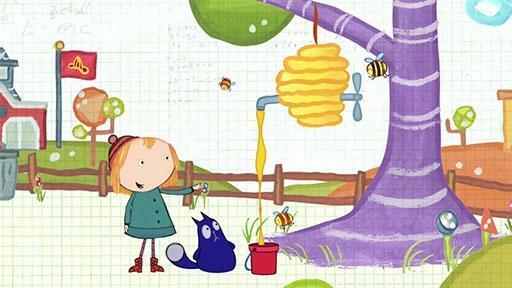 Peg and Cat learn that when a bucket is empty, it's light, but when it's full, it's heavy.